The beauty about this style journey is you are allowed to make mistakes along the way as long as you learn from them. Once you know better, you do better. I believe part of my responsibility as a style blogger is to look back at my mistakes and expose them to the readers/viewers in hope that you all won't fall for them. The benefits are mutual. The readers/viewer get a chance to spot the pitfalls to avoid them and I get to see how far I've come and my style has evolved. A dark and disappointing aspect of my line of work is bloggers, "experts" who act like they came out of the womb wearing custom made suits and looking down on others who "aren't on that level" as if they weren't rocking square toe shoes not too long ago. I try to convey a level of humility in my advice because that was me too not too long ago committing some serious style mistakes and as a Fit Man, I've made alot of them! Here, I try to comply a list of my personal mistakes I've made over the years and how you all can avoid them. I cringe at these so bare with me. There's something about wearing a suit jacket, blazer or sports coat that just boosts my inner confidence. The closer the fit to the body the better it smooths out my silhouette. My first mistake was when I was working at Men's Wearhouse, I'd grab an off the rack coat at size 42 Regular which would fit just fine but since I loved that close to the body feel, I'd get it tailored some more. Against the tailors suggestions, I'd get the center seam or sides or sometimes both taken in. BIG MISTAKE. Yea, it gave me what I was looking for short term, but long term it hurt me. Structured garments like anything off the rack just ruins its authenticity and with my continued workouts, my body got bigger and jackets got tight. I understood the importance of drape, have the jacket fall on your body as naturally as possible. 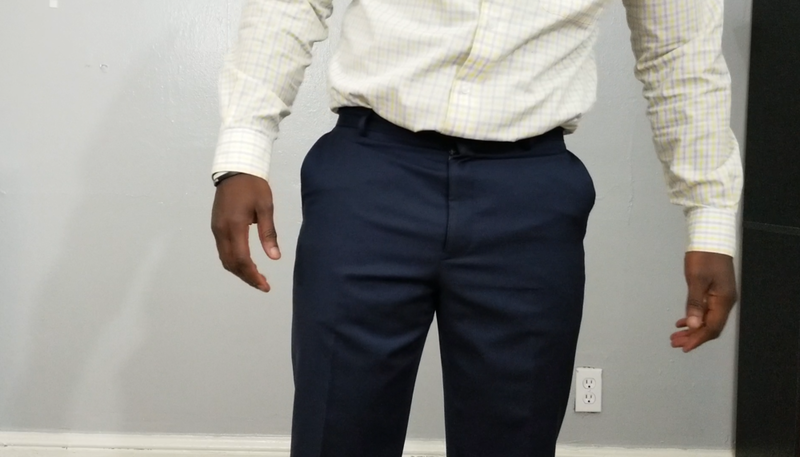 Now, I'm a 44 Regular (chest day gains) untailored and it drapes properly, leaving the only thing I get tailored is the sleeves because I like to show some cuff. You don't need it so snug to you body thinking it will compliment you physique, it'll rather be tight and uncomfortable. So listen to your tailor, who most likely has been in the business longer than you. I used to beeline to all things slim fit. BIG MISTAKE! I learned quick that fit men and slim fit don't go together. Especially in pants?! What was I thinking?! I know I like the tapered look but these quads wouldn't allow it. It would show an obvious pull in the front and in the seat which made my pockets flare out. All signs of a bad fit. Relaxed, classic fit. If I had to I'd taper the legs but I need that comfortable fit around the front and the seat. Again,drape is very important here. I don't have a pair but I am strongly considering pleated pants because the pleats give my quads that room I need. Did you know that multiple cycles in the laundry will make your shirt and it's collar shrink? So it may feel great when you purchase it, may feel great the first couple times you wear it but eventually it will shrink and get tight on you. 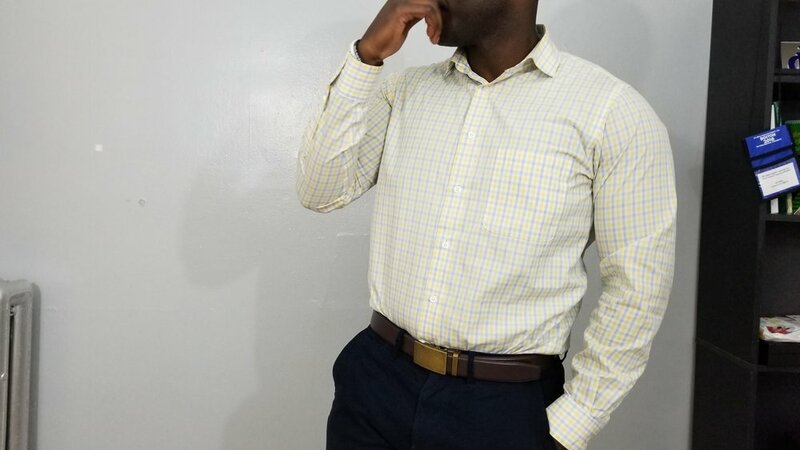 Not only will you feel the uncomfortable tightness in the arms and chest, an obvious way to know that a shirt is too tight is when you see the buttons pulling at the chest area. Since that is an area alot of fit men have problems with, it's best to have a shirt that fit comfortably. Drape! Drape! Drape! See a theme here?your clothing should rest naturally on your body and having a fit physique makes this even more important. First solution will be to ditch the slim fits and stick to the classic fit with little to no tailoring. Remember, it will eventually shrink and you'll also gain muscle mass. Second solution, look for a split yoke in the back. Majority of the shirts out there are made from 100% cotton which doesn't stretch vertically or horizontally. This is when the fabric has been stitched diagonally therefore allowing the cotton to stretch at an angle. Third solution is a no brainer if you have been paying attention to my content and that's stretch. Find a shirt that has a small percentage of stretch fabric and it can be a game changer. 4. Thin Lapels On Jackets - Proportion. Thin lapels. *face palm* The suits in this modern age are going for the slimmer more flattering cut and unfortunately the lapels fall victim to the cut as well. The problem is every man's body isn't the same especially the fit men and the three most common body types we have. A suit/sport coat/ blazer lapel size should be in direct proportion to a man's chest. A lapel size that works for an ectomorph will DEFINITELY NOT work for an endomorph, chest sizes are totally different. Unfortunately for me, all of my jackets have a thin lapel that is not complimentary to my 44inch chest, even my custom suit one. I mentioned in that post that a drawback of that Men's Wearhouse process was there wasn't a way to increase the lapel width. Simply put, bigger chest, wider lapel. Smaller chest, smaller lapel. Mid size chest, mid size lapel. You don't even have to be athletic, if genetically you have a broad chest, you have no business wearing thin lapels. Measure that lapel width. For a guy like me with a 44inch chest, I need to be wearing at least a 3.5inch width lapel. It compliments my chest and shoulders. I've seen really exaggerated lapels like the ones Daniel Re wears on Instagrams. The good people over at Oliver Wicks wrote a great blog going into much detail about lapel width size. Where can one find wider lapel size since the regular ones are so easy accessible? Well, since the reason for a modern cut/lapel size was due to a pull away from the old school, there are vintage stores that sell wide lapel coats. This could be another reason to go custom, since they are a readily available option to resize your lapels. Brands such as Suit Supply and Oliver Wicks have ready made and custom suits with the option to go with a regular or wide lapel. Whew! Walking down that memory lane was tough but needed! No matter how much I've learned there's always someone out there is is further along the journey I can learn from. As much as you guys listen to me, I listen to some O.Gs in the game. Don't be afraid to make mistakes, we all do. One way to do something right is to do it wrong quickly and learn. Don't be too hard on yourself, use that rear view mirror to see how far you've come. It only gets better from here.